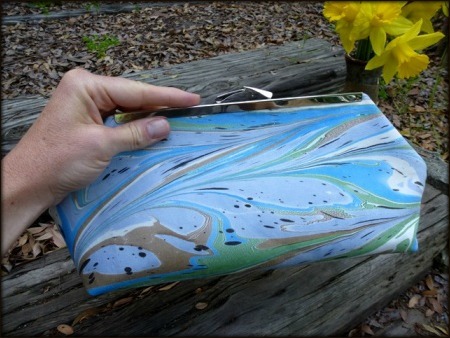 Marbled Clutches ~ Now Available for Pre-order! So how's this for super awesome... As I mentioned in a previous post, I am working with fashion accessory designer Jeanie Joe on creating handmade clutches using my marbled fabrics. And, as I mentioned on Facebook a week ago ("Friend" me if you're interested in following me there too), I recently completed a studio session where I marbled more than 15 yards of fabric for our clutch collaboration. That can only mean one thing: CLUTCHES FOR SALE! We are now taking pre-orders for one-of-a-kind, gorgeous, beautifully hand-crafted clutches! Before we bring our inventory to boutiques, you have the opportunity to pick your marbled fabric and have a clutch made just for you! For more information, visit the special Pre-Order Clutch Sale page. Don't miss out on this great opportunity to snag your favorite marbled design on a roomy, stylish clutch that will have heads turning!